If you are looking for something that is both beautiful & durable then look no further than this beautiful Himalayan Gourmet salt bow. After all, the salt used to make these bowls is more than 250 million years old. This gift box would make a wonderful gift for your favourite teacher, Fathers Day, Christmas Gift, Mum or Dad, In-laws of all sorts, family and friends, a retirement, home warming or birthday gift. Red & Black saddle stitch gift box. Now that you have this beautiful bowl what do you do with it? Thanks to its pretty pink colour, a Himalayan salt bowl will look great just sitting on a shelf by itself but why waste such a beautiful useful bowl. These are not just a pretty face, so make the most of them. Cooking: Himalayan salt can withstand very high temperatures including a trip to your oven or BBQ. Perfect for baking and serving. These bowls can also withstand being frozen, so use your bowl to whip up your favourite dessert and make a dramatic presentation from freezer to table. As an active fruit bowl: Himalayan salt bowls retain both hot and cold temperatures evenly - and for long periods of time - you can rely on the salt bowl to keep fruits cool and crisp throughout that outside BBQ. Replace your gravy boat: Gravy boats are designed to easily pour your favourite sauce but they don't keep warm. Replace the old boat with a new salt bowl. Heat the salt bowl in the oven and it will keep your gravy and or sauce warm for hours. Hold your precious scented candles: Himalayan salt bowls make fantastic candle holders. Lit candles accentuate the bowls unique colour. 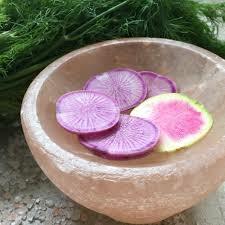 Cooking with a pink salt bowl naturally imparts the incredible health benefits of Himalayan pink salt into your food. Such health benefits include balancing your body's PH, stabilizing hydration levels, improving digestion and reducing acid reflux. In addition pink salt contains over 80 trace elements. Meals prepared using a pink salt bowl will take on more complexity, turning familiar foods into a new and interesting experience. A hint of salt, not a lot: Himalayan pink salt has a very low porosity and minimal moisture retention. Because of these 2 traits HPS won't immediately upon contact transform food into an unbearable salty mess. Instead your pink salt bowl will impart just a hint of its very interesting salt flavour into your food. Naturally Anti-Microbial Surface: Unlike other food preparation & cooking surfaces, you'll never have to worry about germs in a Himalayan pink salt bowl. This is also due to the low porosity & moisture retention of the salt which creates a naturally anti-microbial environment.